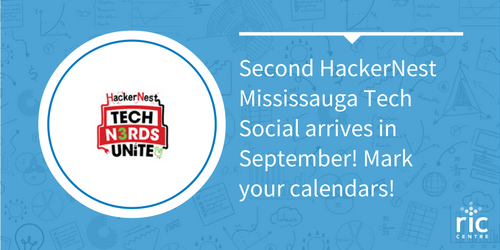 The second HackerNest Mississauga Tech Social arrives in September! Mark your calendars! HackerNest believes that strong, supportive tech communities should exist everywhere – not just in hotspots like San Francisco and New York. In 2011, HackerNest started running Tech Socials in Toronto, where monthly attendance grew to over 350+ technologists literally 100% from word-of-mouth. Mississauga is the 6th largest city in Canada and home to a wealth of talent and innovative corporations! So come out to meet and mingle with them! HackerNest Tech Socials are Entry by Donation – any amount appreciated, but $10 suggested. The City of Mississauga – Formed in 1974, Mississauga is now recognized as Canada’s 6th largest and fastest growing major city with a population of 729,000 residents representing cultures from around the world. With close to 55,000 registered businesses employing more than 425,000, Mississauga is home to 61 Fortune 500 Canadian or major divisional head offices and 50 Fortune Global 500 Canadian headquarters. Web Unleashed, the front-end developer event, will help you learn the skills you need to push you ahead in your career. Get all the latest know-how from speakers who are leaders in the industry, and save 10% with code HackerNest! HackerNest is an international nonprofit uniting local techcommunities through unpretentious Tech Socials andhackathons. We cram lots of smart, accomplished people into a room with free drinks. Our relaxed, down-to-earth events attract a diverse and highly technical membership. Strict no-douchebag policy.